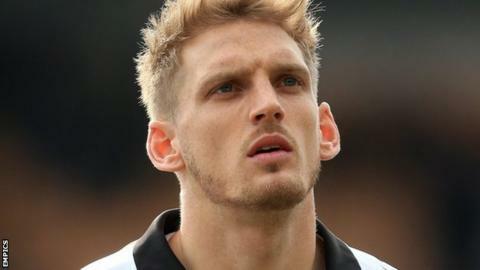 Port Vale have sacked defender Daniel Jones with immediate effect following the training ground incident that left captain Doug Loft with a facial injury, reports BBC Radio Stoke. Loft, 27, has been ruled out for the rest of the season after suffering a suspected broken cheekbone in an altercation on Thursday. Vale manager Micky Adams said the club would hold an internal investigation. But they have opted to sack Jones, 27, who had a further year on his contract. Loft is out of contract at the end of the season. The League One club have said that they will not be issuing any further statement until later this week. Neither player - both of whom have been first-team regulars for the last two months - appeared in Saturday's 4-2 defeat at Notts County. Vale, who came up from League Two last year, suffered a second straight defeat to fall 10 points adrift of the League One play-offs with four games left, ending any lingering hopes they might have had of a second successive promotion. "For legal reasons, there's very little I can say other than on Thursday there was an incident between two players. "Incidents like we had are disappointing, but they happen.